A great invention to protect the lives of the troops in war-torn countries. I was wondering are these robots able to withstand bullets and bomb blast? Avery useful invention indeed. Im sure it will be able to withstand a bomb blast..Unless it has been designed and made with 0% failure rate. I do hope that is the case, because of the amount of trust these troops place on the robot. Imagine, if they thought the whoel field was clean, but actually some mines were left unnoticed..
Then again, it is better to have a reduced number of mines that a whole field full of them..
A indeed helpful and great robot, it makes the wars safer, though there is no safe war. maybe in the late time, we dont send humans to the war but instead, robots will be the main forces just like what we watch in the movie. The robot seems to be wireless controlled. However, I really wonder accuracy of the signals received by those sensors to be sent through wireless transmission to the controller. Especially during mine-clearing mission. PackBot sounds like a great product for war. It will help in saving lives of soldiers. But will it be able to survive a bomb blast? I guess even if it is unable to withstand such attacks, it will still be used by armed forces just to save those numerous lives. Its obviously better to sacrifice a robot than let soldiers be a victim of the mines. This robot is totally cool. With this little guy around, it can help to save lives. I think the designer of the robot can build on this and make it into a minelayer instead? So that it lay mines in enemy territory and yet will not harm the soldier who is controlling it. 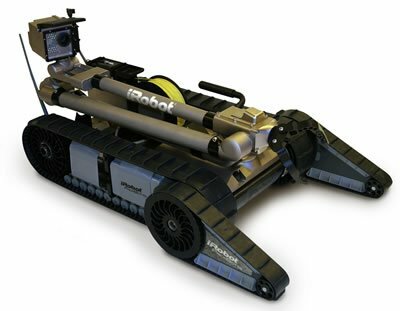 Future developments could have teams of robots deployed over a large area to speed up mine detecting operations. 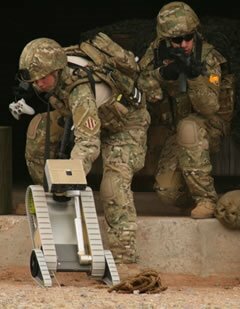 The robots could communicate with one another using ad-hoc wireless networks to update their progress and build a virtual map of the cleared mine region. This would come in very handy to clear minefields in war-torn areas especially in the Middle East where many innocent civilians are still killed by old mines left over from wars many years ago. The detection of explosives is a wonderful area for research on sensors, Neural Networks and navigation. If you are in need of cheap single units (since you have to scan an area from a very close distance and need many of them to actually clear a larger field), self-organized behaviour based on verys little input information could become necessary - this is a nice application area for techniques of swarm robotics!